A toast was being made. “To the continued success of the Tourmaline Queen.” Champagne glasses clinked underground to a murmur of approval. Approximately one hundred people were enjoying themselves discussing minerals, the beauty of Pala, and the weather. They had come from far and near. Dr. Pierre Bariand of the University of Paris, Dr. Peter Embrey from the British Museum, Louis Moyd of the Canadian National Museum, Paul Desautels and John White of the Smithsonian, Prosper Williams from Canada, and Josie Scripps from San Luis Rey, California, were among the many persons in attendance.A party to remember was unfolding. But, champagne underground? What was being celebrated? Why had all these people come to a mine? Pala Properties was giving the party at the Tourmaline Queen Mine for its recent notable success. This success was due to the efforts of numerous individuals; most of the credit going to Ed Swoboda, whose vision had seen the possibility of successful modern-day gem mining. Other key figures from Pala Properties would include John McLean, the mine foreman; Jose Montes, the miner; Buzz Gray, the gem expert and faceter, my wife Karla and myself. Those who kept the machinery going, notably Bryant Harris; those who kept our moral high, Carl Larson and Bernie Hines; our close friend, Josie Scripps; the photographers, Harold and Erica Van Pelt and Dean Luxton; and others too numerous to mention. Above all else, the credit must go to the Tourmaline Queen herself. The Tourmaline Queen Mine located in Pala, San Diego County, California, has always inspired mineral collectors, high graders and geologists. It was originally claimed by Frank Salmons and Associates in March, 1903. Exploratory work yielded some 80 pounds of gem tourmaline. The Queen immediately became the leading producer of tourmaline in the Pala district during the period 1904 through 1914. 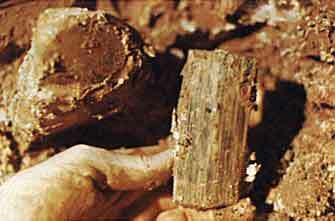 With the collapse of the major Chinese market for tourmaline, due to the 1911 overthrow of the Imperial government, the mines soon became uneconomical. From about 1914 to 1971, the Queen was worked intermittently by high graders, with limited success. When I first became interested in collecting in Pala in the 1950’s, I can remember how the local collectors, novices and experts alike, made statements about how the Pala area was almost completely worked out. Detailed questioning would produce facts and figures as to who tried what, where and why they had failed to locate gems; but contrary to usual opinion and hard luck, a few mines did produce gems during this era, keeping the prospectors dreams of riches alive. The main adit at the Tourmaline Queen mine, circa 1972. A successful mineral collector knows one secret... there is always something more to be found in every locality. This knowledge, coupled with the notable Pala discovery of beryl by Norman Dawson from the White Queen Mine, started many people thinking more positively towards the other mines in the district. The old negative attitude was gradually replaced by typical miner optimism and foolish hopefulness. Pala Properties International, Inc., became involved in the Pala mining district when Ed Swoboda purchased the Stewart Lithia, Tourmaline Queen and Pala Chief Mines. We had been mining the Stewart with mild success since 1968, when we decided that it was time to make the switch up the hill to the Tourmaline Queen. Originally our idea in mining the Stewart was to set up basic operations, learn the gem mining trade, and then move up to the Queen which we were sure was more promising. However, with the discovery of the famed lost tourmaline adit and initial production of a few fine tourmaline crystals, we overstayed these original plans. But without increased production, economics forced us to make the necessary move up the mountain. Drilling is essential. Here, John McLean and José Montes use a pneumatic jack leg, used to support the drill during drilling. After much talking and planning, Ed Swoboda arranged for a bulldozer to repair the road, create a working pad and move the compressor. As luck would have it, the bulldozer was delayed one week; and with a lack of anything better to do, John McLean placed a final blast in the Stewart between two adits where a rich zone of lepidolite was exposed. When the fumes cleared, John checked, and lying in the rubble pile was a tourmaline a full 10 inches by 4 inches looking at him. In disbelief he muttered thanks to the mine spirits and took it out to show Jose. Jose thought it was a quartz crystal. Seeing the red, he started wildly jumping and celebrating. And so it went—no one who saw this large crystal could believe it. After three-and-one-half years, it was a crowning glory. The crystal remains the largest and finest tourmaline produced from the Stewart Mine. After checking to see how the new zone was, we could see the Stewart pocket was a lucky fluke; and we went ahead with the process of moving. It would be too difficult to move living quarters to the top of the hill, so we had to continue to have our base of operations at the Stewart Mine and commute the two uphill miles in our trusty yellow truck. The bulldozer finally arrived, the road was improved, a small pad carved out and the compressor placed. All was now ready for operations to begin. The old adits were in terrible shape, as the working face had sluffed in during heavy rains a few years before. We didn’t have any idea of how the inner workings had fared. I had not been in them since 1963. They were workable then. Al Ordway and Bob Bartch (the best field collectors I know) had been in the mine more recently, noting that conditions then were barely workable. We decided to “poor-boy” the operation until we hit some limited evidence of future success. John and Jose dug a trench with pick and shovel until one of the old adits was intersected. The trench was enlarged until ventilation was possible. After several hours, we went below to check out the workings. The upper adits had suffered most from the heavy rains. They had filled up with silt, making it impossible to traverse them without crawling on one’s hands and knees; however, they had not caved in. Water had completely filled the lower workings, leaving the walls slightly covered with mud. We were able to locate one route to the surface through which temporary airlines could be brought with minimal effort. 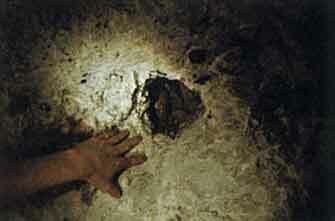 A clay pocket exposed in the pegmatite. The next problem was where to begin our exploratory work. 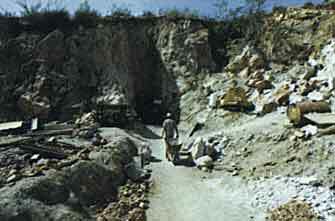 With the walls coated, chipping was necessary to expose the mineralogy of the pegmatite. A suitable area was found where a pocket had been removed in past operations. The back face of this adit showed evidence of slight enrichment such as large feldspar crystals, minor schorl tourmalines and large grains of lepidolite. Some of the schorls in the ceiling showed exteriors of pink and green tourmaline indicating the possibility that good colored crystals had been found in the past. We were all quite excited, as prospects of beginning operations became closer and closer especially with such a good area to explore. This was the same area Ed Swoboda had wanted to work many years before. I had also done considerable sniping in this same area, and John Sinkankas was similarly convinced it would yield more pockets. All equipment was set up on a temporary basis so we could drill and blast in several areas to see if we wanted to go into the great expense of setting up a more or less permanent operation. Our equipment would be minimal, a compressor, jack leg, drill, rubber hose and electric generator. We would not worry about mucking during the sniping operations, as there were several blank tunnels we could backfill. We needed a small strike to strengthen our convictions that this mine would be more productive. A tourmaline crystal coated with clay in a just-exposed pocket. 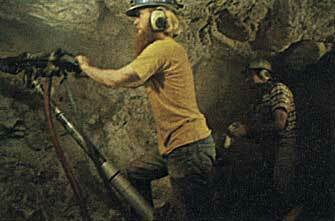 John McLean began drilling and blasting by September 1971. He was really roughing it. Water was placed in the drill holes manually to keep dust down; and after a blast, the material was backfilled into the nearest adit, which had been deemed unnecessary. After two weeks of backbreaking work of this sort, 20 feet of new tunnel had been carved out downdip. Buzz Gray and I were up in Seattle at the National Gem and Mineral Show when I got a call from my wife, Karla, that a large pocket of dark blue tourmaline had been hit. Buzz and I were overjoyed at the prospect that this mine would indeed be productive. As soon as we returned, I examined what remained of the pocket. It had been about 2 x 2 x I feet, quite a nice size and contained a sticky red clay. Four fine tourmalines had been found, one single crystal doubly terminated 3 x 2 inches. The three matrixes were all similar; each had a single crystal 3 x 2 inches attached to a quartz crystal. Many quartz crystals were found, all with distinctive montmorillonite inclusions giving them a white to pink opaque exterior. 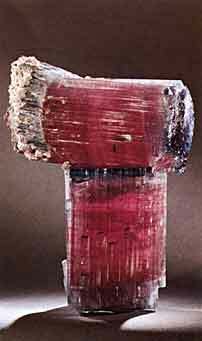 The most exciting aspect was that the tourmalines, while dark blue on the exterior, were deep rubellite on the interior, almost too much to hope for since most of the recent pockets that had been documented lacked rubellite. The mine had passed its test. We must now back off and go about mining seriously. This would be expensive and time consuming but, hopefully, worth the effort. The pads were made permanent, concrete replaced dirt; the dangerous face which had sluffed in during the rains was blasted back resealing our crawl hole. For over a month, pick, shovel and wheelbarrow worked to reopen the main adit. A winch had to be installed to bring the wheelbarrow up the adit as it followed the 12 to 15 degree dip of the pegmatite. Our operations were basic; hand operations cleared all the muck, pick, shovel and wheelbarrow over and over again, each blast making many more hours of the same grind. An unusual pair of tourmaline crystals; the individual crystals are approximately 2.5 x 5 inches each. Little by little the adit was cleared to the area where the indicolite pocket was found. After two months, we could walk standing up the 180 foot downdip instead of crawling. The pegmatite continued to show signs of increasing richness. The size of the lepidolite crystals had increased two or three times. Much cleavelandite feldspar was still present along with subhedral and euhedral quartz and perthite feldspar. The next six feet or so was unproductive; however, all the pocket indications continued, and we were again rewarded with a pocket. This time it was a small vug series, a group of interconnected vugs from fist size to football size. These vugs were quite devoid of gem minerals being mostly filled with a red clay on top and a sandy clay on the bottom. 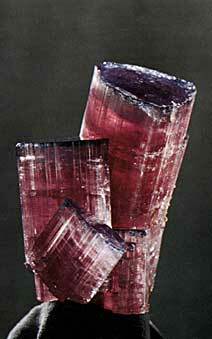 When tourmaline was encountered, it was usually present in 1-inch crystals clustered near the bottom. Tourmaline crystals were found up to 2 inches in diameter in one vug; however, even the most careful removal yielded only crystal fragments. They had grown into the walls having only contact terminations at best. 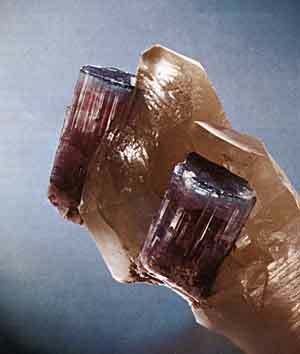 The most exciting aspect of these larger tourmalines was in their color, they were rubellite without any indicolite at all. We were all much more excited by these poor specimens than anything up to that point. We figured the indicolite watermelon tourmaline was as close to red as we could hope for. We carefully removed all the vug contents into our powder boxes to take home and wash. Washing the pocket contents is always a time for great expectations. Rarely is a really good piece missed during the pocket removal; however, so many more tourmalines show up in sunlight with screening and washing that there is a chance for everyone to pick out small “goodies.” Washing is a crude process of placing all the carefully removed pocket contents into tubs of water to soak. When the clay has absorbed water, it is more easily removed. The sticky mass is placed on a large screen supported between two sawhorses. A garden hose is used to spray the clay while a scrub brush is used to break down the larger clay masses. As this is being done, the different minerals become recognizable. No matter who is doing the washing, as red flashes are seen, hands fly out and grab the tourmaline crystals. After a few minutes, the screen contents are bright and clean; everyone gathers round it to pick out all the crystals. Screening the contents of these vugs didn’t produce any large crystals but many more 1 inch crystals did show up, and more interesting were the several morganite thumbnails that were found. 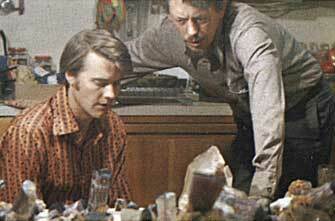 A youthful Bill Larson with Dr. Vince Manson, then curator of the American Museum of Natural History, examining tourmaline specimens from the Tourmaline Queen find in 1972. Work was continued downdip past the vug area. Ed and I were gone a great deal of the time buying collections to keep our business supplied. Perhaps it was meant for us to be absent, for the next 40 feet of tunnel were the most barren footage I have seen at the Queen, no lepidolite and fine grained quartz, feldspar and muscovite. The first chance I had to examine the new workings, John had just encountered what appeared to be a fault plane crosscutting our tunnel. The rock looked barren on both sides of the structure and barren all the way from the vuggy area. If I had been there all that month, I doubt I would have continued this far in the downdip, but since John had gone this far, he wanted to try a little to the right and down. It seemed a little softer to him there. The next shot uncovered lepidolite, at least a little more promising. One week and two more shots, he hit a small pocket. It contained one specimen, a quartz crystal about 5 x 4 inches with a rubellite tourmaline flaring out of the center, 2 inches in diameter. The tourmaline was recovered in three pieces, but careful repair would make it into a fine specimen. These tourmalines are broken by nature in the pockets through final phase explosive pocket formation, earth movements and general decompositions, especially a small pocket like this, where the tourmaline, when perfect, filled the entire pocket from side to side. The discovery of a rubellite specimen of major consequence really turned us all on. Daily I was in contact with the mining operations. Ed would call or come down from Los Angeles as often as possible as we were now sure something major was shaping up. I was working in the shop with a fine jewelry designer from Bar Harbor, Maine, Mr. Rocky Willis, when John came down from the mine to tell us he had hit a new pocket. “I can’t tell how big it is, but there is one tourmaline exposed measuring 2 x 2 inches.” This was enough for all of us, so Buzz, Rocky and I followed John up to the Stewart and up the long road to the Queen. Entering the mine, we found the new workings had now taken a 10-foot jog to the right, starting where John had originally found the softer material. The pocket was exposed at the back of this new short adit near the center about two feet above the floor. It was elliptical about one-and-one-half by one foot. Quite a sight for Rocky, as he had never seen a gem pocket before; all solid feldspar, quartz and mica making up the walls and here in the center of this seemingly solid mass was a brown wet sticky mass of red clay. Exposed on one side of the opening was the 2 x 2-inch tourmaline scraped clean and glowing red in our light. I took my screwdriver out and checked the depth of the clay. It was deeper than my 10-inch long screwdriver as I could bury it up to the handle. This could be a large pocket. I removed large globs of sticky clay from the center of the hole with my fingers and small ice picks. The pocket was definitely increasing. We worked for about an hour and removed four or five powder boxes full of clay and quartz crystals. We were back 18 inches from where John had exposed the pocket. I could still bury the screwdriver to the handle. “This is a pocket to call Ed about.” I finally removed the tourmaline that John had exposed, leaving it for a final reward to pluck after the tedious pocket work. It came out easily a single crystal, but different than any of the other tourmalines found so far. When I cleaned it with my thumb, I felt a smooth glassy termination; and as it became cleaner we gasped. The termination was a bright indicolite blue. 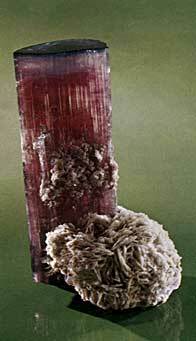 Here was a real treasure, a bicolor deep rubellite tourmaline with a vivid blue termination. We tore ourselves away from the open pocket to await tomorrow when all could join in. Ed and his wife, Kumja, came down early the next day. The tourmaline I had dug out was even more beautiful after cleaning, firing Ed’s imagination. We wasted little time getting up the mountain. The pocket looked quite big after all that I had removed the day before. Ed got right in and began to probe. We brought in foam rubber pads to lie on and settled in for a day’s work. Using his fingers, Ed removed glob after glob of clay; he was soon covered with red sticky mud. The tools became completely coated. You could hardly pick them up. The clay had shards of quartz and feldspar through it, so you had to be careful not to slice your fingers. Gloves are impractical as they interfere with the sensitive touch necessary so you don’t break anything important; and, of course, gloves pick up so much of the clay they soon weigh several pounds. Ed had been digging for several hours and had removed 6 or 7 powder boxes of clay without finding a single tourmaline crystal. We called up a few friends, Josie Scripps and Bryant Harris to share the find. Would they like to go up to the mine in the dark? Josie said “not on your life” but she was really excited about the find even if she wouldn’t venture up the mountain. At 9:30 we assembled: Ed, Buzz, Karla, Bryant, Carl (my father), and I. Fortified with a quick brandy, we drove through the night to the Stewart. Poor Jose was sound asleep. The motley crew must be crazy going up to the mine in the middle of the night. The six of us piled into our yellow truck, a hilarious sight. I was elected to drive up the two-mile road; rough enough in the daytime, it was treacherous and dangerous at night. Slowly we inched our way up the mountain, our lights going off into outer space as we would bounce over a boulder. I had only one close call, dropping the front left tire into a small ditch; however, the only harm it did was to bounce a few passengers who were riding in the back. Someone cursed about shaking up his beer but on we went. 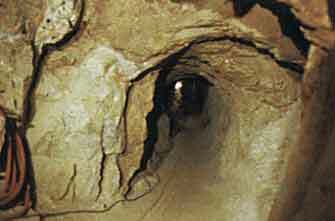 A view of the tunnel walls looking down the main adit. Finally getting to the mine, people tumbled out of the truck trying to get oriented. It was quiet and beautiful overlooking Salmon City, the deserted old mining camp below. It had been the living quarters for the miners of the area in the early 1900’s. I wondered about all the stories of highgrading you hear about as most of the thieving took place at night. Feeling vaguely like a highgrader, I went over to break the silence and started up our electric generator. As it coughed into life, all visions of the old days vanished as the original miners had used carbide lamps or candles. We almost raced down the now familiar adit to the pocket. The pocket was really large now after we had worked it all day and John had expanded it in the evening. Ed laid at the pad and settled down to more profitable work. For ten minutes or so, no tourmalines showed up; and we had visions of another dry run. Then he hit a really big one, four inches at least as he scraped his fingers along the crystal. A real artist at pocket removal, Ed began exposing the crystal. Near it on one side he exposed another crystal of similar proportions. The two were nearly parallel and visions of a matrix specimen danced in our heads. After another hour or so, enough material had been removed to show that they were only singles, but what singles! With the same fabulous colors, they were the finest crystals to date. Karla cleaned them with a little beer, and they looked beautiful. Each had a little damage on the terminations for these large crystals were originally attached to the roof of the pocket and were broken when they had detached eons ago. By the time these two crystals had been removed, the pocket was back so far that whoever was digging in it had to crawl into it. As it was nearing 4 a.m., we decided to call it a night. We woke Karla as she had curled up around the two crystals. Everyone felt well rewarded, and we knew there were more thrills awaiting us as this pocket would continue. For the next week John cleared the area around the pocket. This was done by careful blasting using half or quarter sticks of dynamite. The original pocket had more or less played out, but two new ones had been discovered joining the original. It was during this time that Dean Luxton, an advanced collector and amateur photographer, decided that the only way to accurately document the tourmaline discoveries was to move in. He rented a camper, filled up the back with a load of photography equipment and parked it at the Stewart Mine for several weeks. He lived and worked along with John and Jose in the Queen all the time while taking many invaluable photos. His aim was to create a slide presentation showing the tourmaline find at the Tourmaline Queen from beginning to end. He took over a thousand photos and has accomplished his idea. This document, one of the finest ever put together on mining, will be shown continuously in the American Museum of Natural History in New York City beginning in February 1973. The Los Angeles County Museum was also contacted; and Barbara Lowe, the Assistant Curator, came down with a photographer. A few good pieces were removed while the cameras clicked, making this one of the first times a gem pocket had been accurately documented. Wednesday night—After having exposed a nice single tourmaline during the day, I had asked my father to go up and dig it out. Driving the truck up the mountain for the second time was a little easier but still frightening. This night we encountered a problem, the electric generator refused to work. No amount of pulling, fiddling or cursing would make it work, even a good luck kick failed. For some reason, Carl thought to bring a large flashlight along; and we entered with it. I was upset at equipment failures; we had been fortunate with most items; however, I don’t think we have ever made a complete week without something going wrong. As we got to the pocket, I forgot our troubles as the red translucence shone back at us through the crystal I had exposed earlier. I tried unsuccessfully to remove, but it was tightly attached. Our first matrix perhaps. To get at the pocket better, I had to use a double jack and chisel. Chip, chip, the work went on so slowly, and I was further slowed by the cramped position. To get the results I wanted took the better part of an hour. Now I could start to remove the clay around the tourmaline. A quartz crystal began to take shape behind the tourmaline. They appeared to be attached; my heart raced, I felt a tremendous urge to rip the piece out to look at it, but I forced myself to use restraint and to continue to work completely around it. As I continued working the specimen took shape; it was really quite large, over a foot, then at the rear I found a second tourmaline attached. I knew then we had a great piece. I was ready for the final removal. We placed a small bar in the center; a gentle pressure was applied, and I could feel the entire mass move. What a thrill! I reached in with both hands and pulled out the now famous “candelabra” specimen. What a sight, over a foot long, it had two tourmalines on either end and in the center top was a place where a third tourmaline had once been attached. We dug for about 40 minutes more and found the third tourmaline. It was a perfect fit. This was a fabulous specimen, one of the finest ever. Friday night—John had finished the necessary preparation of the two connecting pockets. One week of meticulous blasting and cleanup left the new pockets well exposed. All of us were terribly excited. The few single crystals found from washing the original pocket mud and a few new small ones from the two new pockets have all been that same beautiful bicolor blue top, red base. The group had gathered at the Stewart: Josie, Ed, Bryant, Buzz, Carl, and myself. As it was still daylight, Josie conceded to accompany us up to the mine but only till dark! The pads were already laid out with tools waiting. The two pockets were about 18 inches apart, each being about 2 feet across. There were a couple of small tourmalines exposed in the bottom of one; this was a sight. While the others joked, drank beer and Pepsi, Ed and I each got into a pocket! This was too much. As I worked back, I noticed my pocket went towards the other. Ed noted this also; these two pockets were interconnected; and if we worked out the bridge between them, we would have one working face, this was completed shortly. Ed and I were stretched out working the same pocket and not even fighting for the same crystals. The singles were coming regularly. After we had each removed three or four fabulous singles, to a toast of beers, shouts and obscenities, Ed leaned over to me and said, “You know, I can die happily now!” Truly a dream come true. I was emotionally drained from the last two weeks’ excitement. As it was getting dark, we went down for dinner which Karla had brought up to the Stewart. About 9:00 p.m., we finished dinner. As the pocket really looked more promising than ever, the men elected to go back up while Josie and Karla would go home and wash the o to 10 crystals we had found. As we drove up the hill for the third time in the dark, the fog had set in, really the setting for legends. We all felt part of something quite special. We were soon both back into the pocket. I didn’t know what all we would find, but I knew it was going to be great. Both of us were working only with our fingers; these pieces were too perfect to risk breakage. More and more singles showed up. The air was fairly blue with excited shouts as each new piece was wiped clean. One crystal would lay under another in a jumble, until we had 10 crystals exposed unbelievable. We were exhausted emotionally, yet we had plenty of excited energy to keep on. One by one the pieces were removed. As I was working on the last few singles, I wiped my fingers across what appeared to be quartz crystal; it showed deep salmon pink, “Morganite,” I shouted. The others crowded around and murmured enthusiastically. As I was working around it, I hit another morganite. This one was a cluster, but there was just too much excitement already. I worked slowly for half an hour, and they came out. 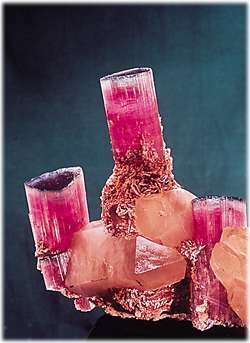 They were matrix morganites, and the matrix was tourmaline. No one could believe it. Morganite on tourmaline? Impossible! Unique, fantastic! but here they were. I continued working and pulled out a perfect quartz crystal, thought little of it, and worked on. About 2 hours later, we had worked the pocket to near completion; as it was quite late, we decided to take our loot and go home. The girls were waiting; the kitchen table was covered with newspapers and 10 tourmalines sparkling clean were laid in a row from earlier that evening. We had forgotten all about them. We unloaded our five dynamite boxes full of goodies and mud and began to clog every drain in the house; no matter, this wasn’t really worth anything. All the pieces were saved for many of the specimens would have to be repaired, creating jigsaw nightmares. As we got most of the pieces cleaned, I found a second tourmaline crystal that fit on the morganite cluster specimen; this was too much. This piece is unique; and, in my opinion, it is one of the finest specimens in existence. I cleaned the large quartz crystal that was so perfect and that we had thought so little of, only to discover that it had places where two tourmalines fit. These were quite easily found; the resulting specimen took everyone’s breath away. Here was esthetic perfection. This specimen was also fabulous. We knew we had three magnificent pieces, the candelabra and these two new pieces. Several other pieces were also major, but one can only assimilate so much. We all had a toast of brandy and stumbled off to sleep.